The first time I heard the words: South Padre, I pictured an island just off the coast of Corpus Christi, the southernmost beach town I was aware of in 2012. This was a time before I had any reason to think my courthouse project would extend to South Texas within the next year. At the end of 2012, I only had fifty-seven courthouses in my collection, all of which would make the redo-list when I created it in July 2013. This was a time before my “courthousing” had fully taken form, when I was still “learning the ropes” so to speak. At the beginning of Summer 2013 and subsequently the end of my eighth grade year, some family friends invited us to head down to South Padre Island with them that July. We’d both take our RVs and make a big summer road trip out of it. We accepted and as the plans for Padre began to take affect, I realized just exactly where the island is. I was astounded to find out it is located at the extreme southern end of Texas, in Cameron County. Within the time between Padre and the courthouse trip that gave me my fifty-seventh courthouse (mentioned above), I’d only been to five others (those in Gillespie, Kerr, Caldwell, Smith, and Van Zandt Counties). When we embarked on our South Texas trip, I had sixty-two. I always imagined that me traveling to South Texas was a long ways off. I had no inkling whatsoever that I’d have the chance to visit some of these courthouses extreme distances away from Granbury. That was the same philosophy I had had with both the Panhandle and West Texas as well. But keep in mind, I visited both of these regions the very same summer. What I’ve learned is, sometimes you don’t know when “courthousing” will happen and to what regions it will take you. Anyway, back to my 2013 flashback. Our friends live outside of Boerne, a quaint Hill Country town that also serves as the seat of Kendall County. We drove down later in the afternoon the day before we were set to arrive in Padre and stayed the night at their place. The next morning, I was able to visit the Kendall County courthouse (#63). And so we went, traveling down I-10 from Boerne to San Antonio to access I-37, for Corpus Christi and next, Highway 77 for Brownsville. I planned on getting every courthouse along this stretch on the way back home. 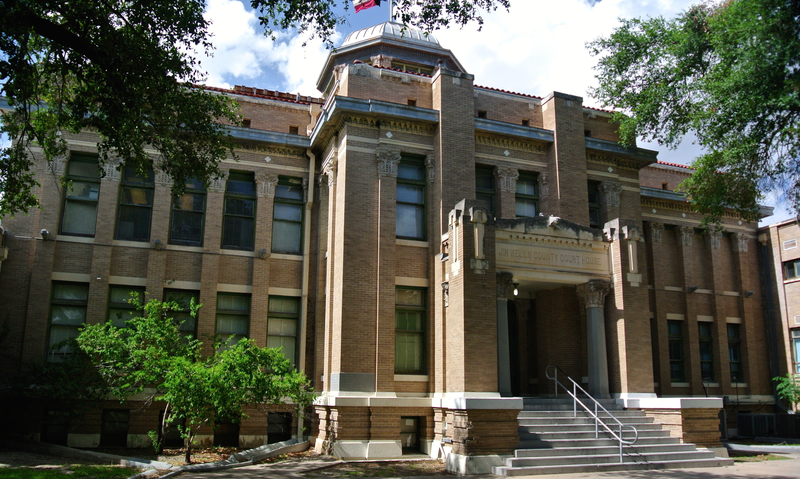 Convenience-wise, the only problem was the Cameron County courthouse, in the county seat, Brownsville. 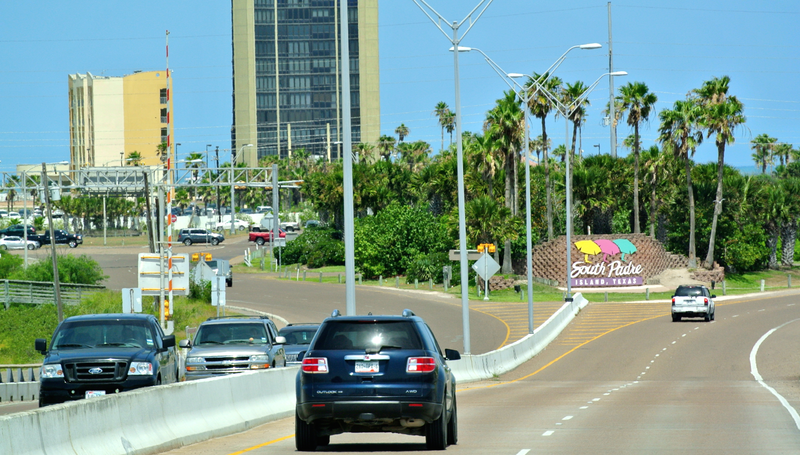 The road to South Padre Island does not pass through Brownsville. So in the RV, there was no way we’d be able to catch the Cameron County courthouse on our way home. Instead, we had to make half a day of it, driving in the car we had towed behind, to Brownsville. There I acquired #64. 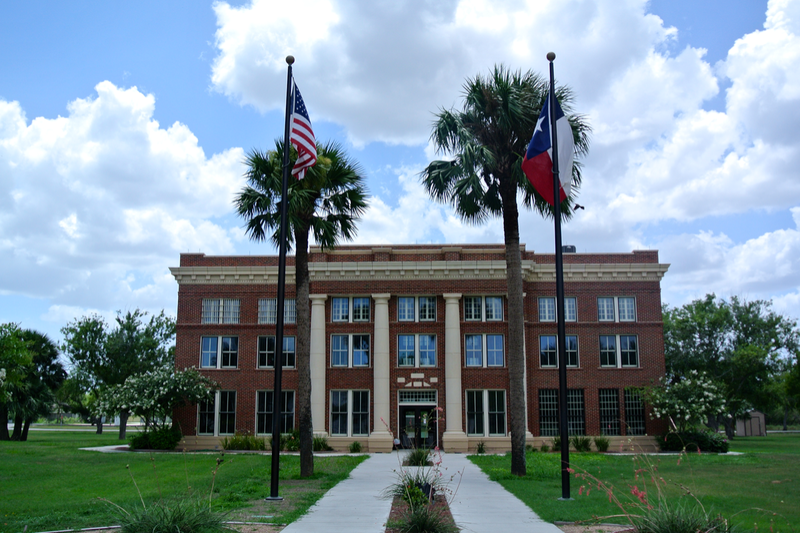 So the story goes on, we headed north to home, stopping in Raymondville, Sarita, Kingsville, Alice, George West, and Jourdanton for courthouse pictures. This was my first experience with South Texas. I’ll skip a week and a half or so into the future. This was the exact time we’d be gearing up the RV again for Colorado. This meant we’d be traveling through the Panhandle and I visited Baylor, Wilbarger, Hardeman, Childress, Hall, Donley, Armstrong, Potter, Moore, Hartley, and Dallam Counties for the first time. The reason I mention this is because it was in one of these counties that I first began to contemplate seeing more of courthouses, photographing them to a fuller extent. It was the Donley County courthouse that helped me to realize that. Unfortunately, I did not listen well enough to my “courthouse conscience” on the remainder of that trip, because all the counties just mentioned made the redo list anyway. 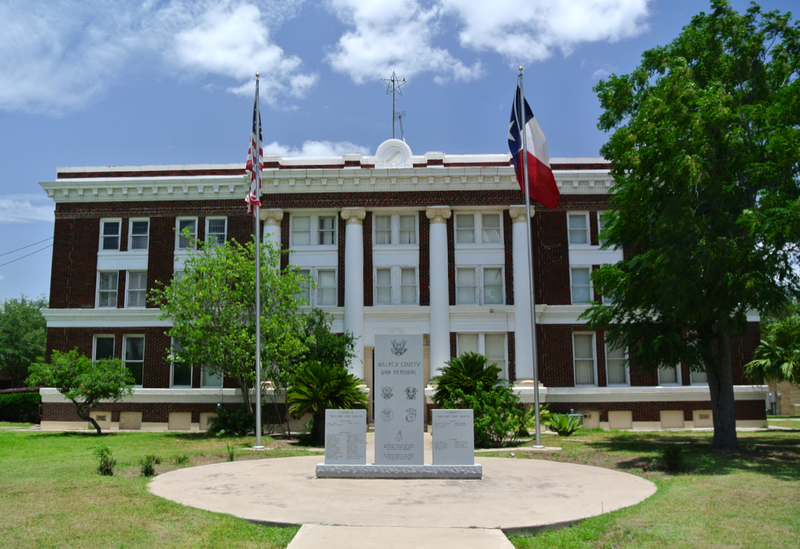 This meant, that now, because I had begun redoing courthouse visits, I was left with two severe challenges: the courthouses in the extreme northern part of Texas and the courthouses in the extreme southern part of Texas. Flash forward to 2014. You may know that I already had the chance to “knock out” most of the Panhandle redos with two days of my three-day Panhandle trip. You can read about them here: Panhandle Round 2 Day 1 and Panhandle Round 2 Day 2 But not yet did I have the chance to see the South Texas courthouses again. That is the focus of this post. So if I haven’t bored you enough already, I’ll quit my rambling and get to the good part. But hey, this is my blog, so I’ll ramble if I want. For our 2014 rendition of South Padre Island, we left Granbury the morning of July 1, eight days before our 2013 departure date, July 9. We didn’t plan on making it to the island in one day (the drive from Granbury to South Padre is one that is very long), rather we’d stay the night halfway like we did last year. Instead of “setting up camp” in Boerne this time, we elected to stay in San Antonio, nearer I-37. We wanted to be able to get up the next morning and get to Padre as quickly as possible. On our journey down, we passed through the Central Texas town of Georgetown, north of Austin. Georgetown, like a handful of other county seats, sits just off of I-35, the main thoroughfare between Fort Worth, Austin, San Antonio, and Laredo. Especially in this area, being north of the capital, there was severe Interstate traffic. My parents remembered an alternate route to hopefully bypass the traffic and get us a good lunch. From Georgetown, we took Highway 130, a toll road and Austin bypass, that also cuts through the seat of Caldwell County, Lockhart. The courthouse here is attributed to Alfred Giles, also the designer of the Goliad County courthouse (the sister building to this one) and a great deal of other courthouses. 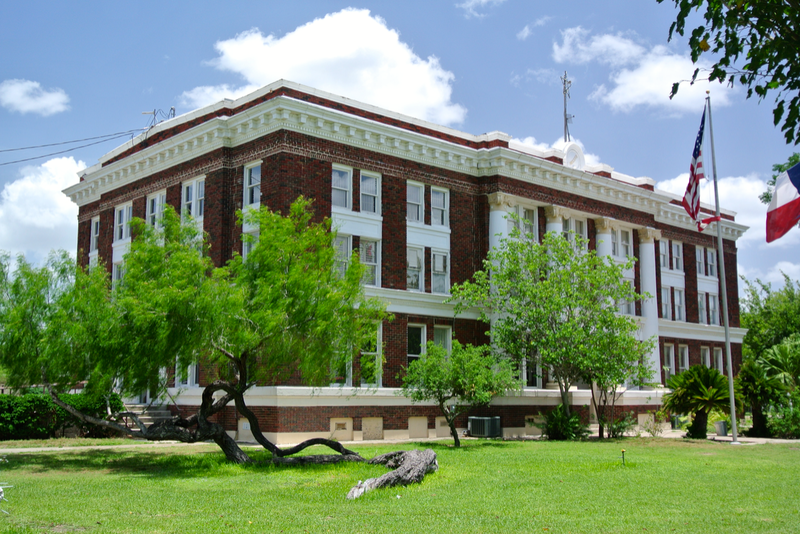 Many say the Presidio County courthouse in Marfa was also his work, but there is no concrete evidence to support that. The stop in Lockhart was unexpected, but it would give me the ability to redo the courthouse here, after lunch of course. In 1999, the Texas House passed a resolution naming Lockhart the “Barbecue Capital of Texas”. In 2003, the Senate did the same. It’s understandable. 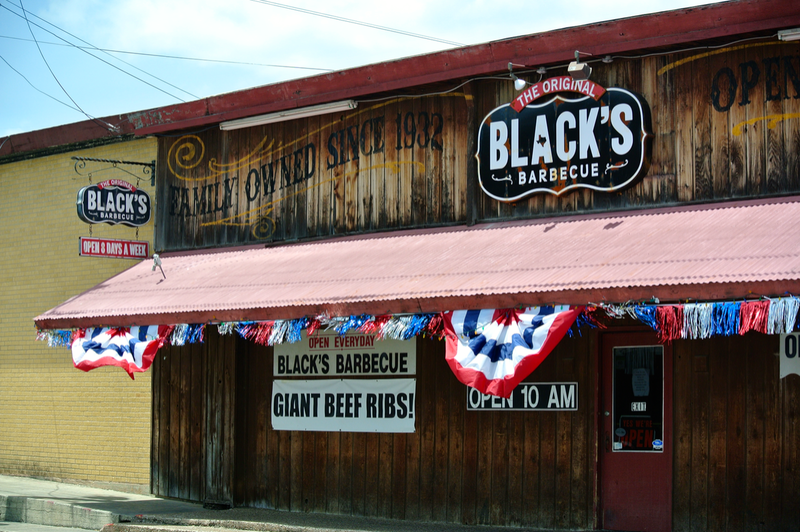 Lockhart has four barbecue restaurants. The city’s website estimates approximately 5,000 people visit these locations each week. In the past, I’d been to two of these establishments, Black’s and Smitty’s Market (I enjoyed both). While the food is good, the wait line in Smitty’s is inside their great barbecue pit. On this hot July day, we weren’t too keen on going any place hotter than outside. So, we stopped at Black’s for a much cooler wait line and a good meal. The plan was for me to eat and then walk down the couple of blocks or so to the Lockhart square to redo the courthouse relatively quickly. It did not take long to realize why that would not be possible. In the past, for almost every courthouse (redo or otherwise) since June 2013, I had taken the pictures I needed with my iPhone. While the camera built in to the phone served me well for a time, I had no idea of the difference an actual camera could make. My first trip using a camera (my grandmother’s Nikon 1) was when I revisited Ellis, Hill, Limestone, McLennan Counties in mid-June 2014. From that point on I was hooked. On the trip previous to Padre (Southeast Texas), I had also used the camera and found that the clarity of the photos was something I really liked. My mom has the exact same kind of camera. Instead of taking my grandmother’s down to Padre, we took my mom’s. Unfortunately, I didn’t even consider the difference in lens between the two cameras. Turns out, the lens on my mom’s camera is a “zoom lens”. This means that to get the kind of shot you want, you have to be standing far away from the subject material. On courthouse squares, this kind of distance is not always attainable. I knew that photography on this trip was going to be tough. I took a few pictures, but eventually elected to just use an iPhone to rephotograph the Caldwell County courthouse. However, with the hot summer sun high in the sky, the lighting was nothing but undesirable. The iPhone camera is notorious for not capturing light well. This makes Caldwell County the first place where I must redo a redo. That’s no problem though. The barbecue alone will bring be back to Lockhart before too long. Even from far away, this courthouse is still very impressive. We moved on down the line, me being disappointed to say the least, to San Antonio. Originally, while here, I had hoped to revisit the Bexar County courthouse, but that was currently out of the question. Instead, we checked in to the RV park and went out only for dinner, at a pizzeria we knew of called Dough. Next morning, we left the Alamo City behind, and got on I-37 to begin our day. Stopping only once for gas, we got to Cameron County in only a few hours. As we drove closer to the island, we traveled through the small bay town of Port Isabel. At the eastern end of Port Isabel is the Queen Isabella Causeway, the only road linking South Padre to the mainland. Climbing the causeway, South Padre soon spilled out before us. It was very much like I remembered. The largest pair of towers (the Pearl Hotel) is the most distinguishing feature, I think. While on the island, for the remainder of Wednesday, Thursday, and Friday (the 2, 3, and 4), I didn’t take many photos with the camera. We did many things while in Padre, enough to probably fill another blog post or two, but that’s not this website’s main focus. Nor was this trip’s main focus on courthouses, they were just a part of it. Either way, I’ll get to the part visitors to this site care about. Jump forward to Saturday, July 5, the morning we hopped in the car and headed away from Padre to revisit the Cameron County courthouse thirty miles to the southwest, in Brownsville. The day before, on the Fourth of July, the inbound traffic to the island was very backed up. We had nearly gone to Brownsville that day, but with the amount of cars on the bridge, we decided against it. As we left the island on Saturday, we noticed that the traffic influx didn’t look to be that bad. That was good news. For the first time since Wednesday, we were back in Port Isabel. See the lighthouse? It is both a state historic site and a popular tourist attraction in the town. I’ve yet to visit it, on either trip to Padre, but it looks very interesting. You can read about it: here. From Port Isabel, we took off on Highway 48 southwest to the third-largest border city in Texas (after El Paso and Laredo). The country between Port Isabel and Brownsville is littered with many small lakes and consists of relatively flat terrain. Soon we were inside the city limits, but it took some time to get downtown. At the end of the road we were on stands the US-Mexico international crossing. The area is naturally crawling with border patrol agents. The courthouse is only a mile or so north of the border. Perhaps you’re wondering how I was able to get a picture like this of the courthouse with the zoom lens. The answer is: I wasn’t using the zoom lens here. My grandfather was kind enough to overnight the correct camera lens, the one I’d been using for courthouse photography, to the RV park office. I picked it up on Thursday. So now that I had the ability to take good pictures, this 1912 courthouse could be added to be redo collection. While there, a huge swarm of barn swallows (or I assume that’s what they were) blew through the courthouse square. I’ve fought through some interesting conditions before, but this was a first. It provided some difficulty too, due to my crippling fear of birds. But because of the extremity of this courthouse’s distance from home, and because my parents had been understanding enough to take me out of the way twice to visit this particular building, there was little chance I’d be back for a long while. I felt like I’d already tested my luck with this second Brownsville trip. A third was not likely. Because of this, I couldn’t let some pesky birds keep me from doing what was necessary. After “battling the birds”, we drove further south towards the border and the rest of downtown. 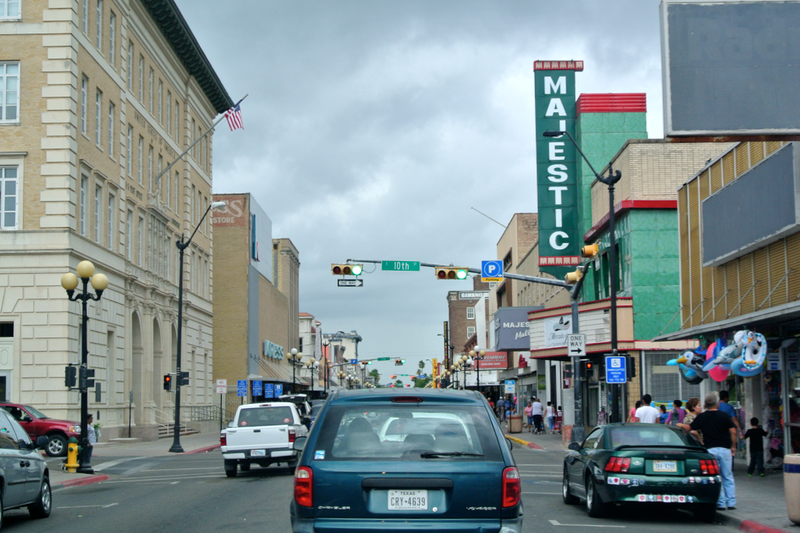 Last year, I didn’t really get to see Brownsville’s downtown district. This time was different. Also downtown is the border crossing. We got an up close view of it. Visiting the border both years has made me think about how very lucky I am to have been born an American. Seeing the lines of people waiting in Matamoros, on the opposite side of Brownsville, really reinforce that thought into a person. We left Brownsville and headed back up to the northeast for Padre. As we got closer, a large rain storm came pelting down on us. Even by turning up the windshield wipers to full speed, the road in front was still a sort of blur. It reduced down to a light rain by the time we reached the causeway in Port Isabel. The bad news was, the bridge traffic was bad again. I was curious why, when the Fourth of July had already passed, so many people were still trying to access the island. We waited for about twenty minutes stopping and going before we could get back. The next day we got up and began to prepare for our departure from Padre. When we were finally ready, we pulled out of the RV park around 11:30 and headed for the causeway. I came to the realization that all the people who caused the inbound traffic on the fourth and fifty had to leave Padre at some point. Many of them chose Sunday, July 6. The inbound road was now very clear, switching roles with the outbound road, right as we were ready to leave. A sea of cars overlooked the real sea all the way from South Padre to Port Isabel. Due to the stop and go speed of the traffic, I was able to snap a few pictures of the area. Remember to watch for pelicans! 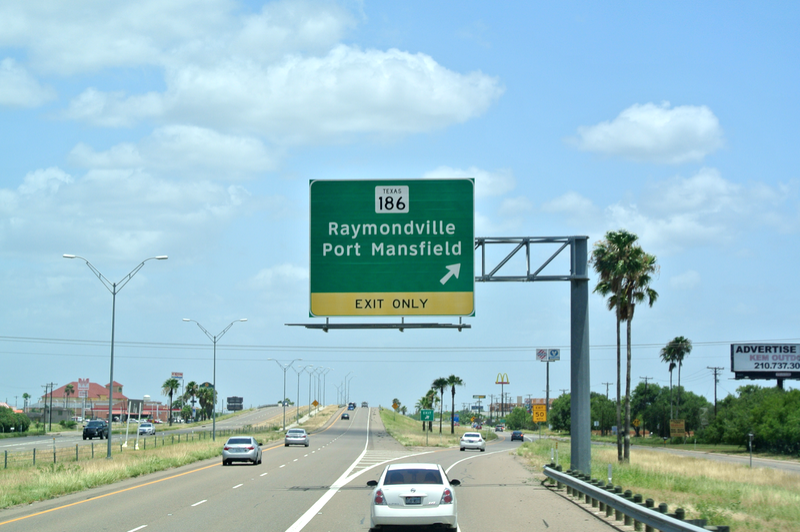 The first was in Raymondville (#65), forty-eight miles north of Brownsville. 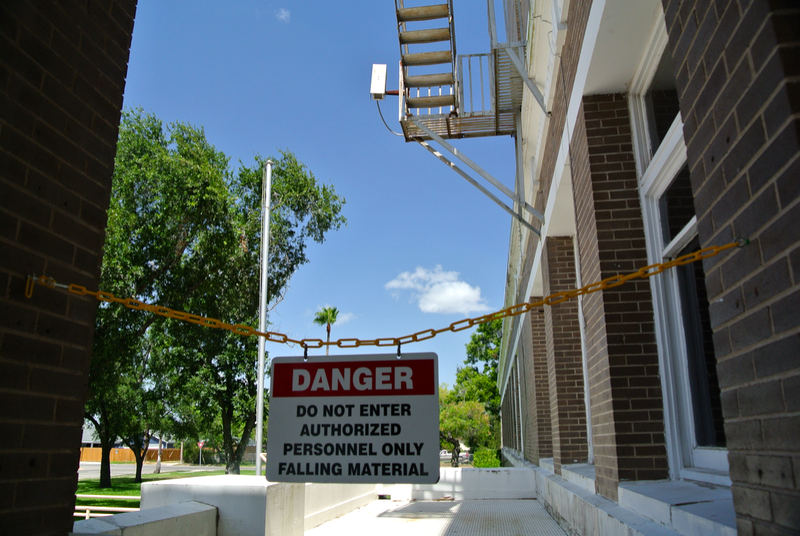 It’s the seat of Willacy County and boasts a 1922 courthouse, one that is in poor condition. From Raymondville to the town of Riviera, fifty-seven miles to the north, stretches a desert of undulating coastal terrain, with little to no remarkable features along the way. It’s the dreaded “sixty-mile stretch”. At its northern end sits a border checkpoint, approximately one hundred miles north of the actual border. Border agents stopped us briefly to make sure we weren’t harboring any illegal people or contraband, before ushering us on. Not far past the checkpoint was the very small town of Sarita, the seat of Kenedy County. 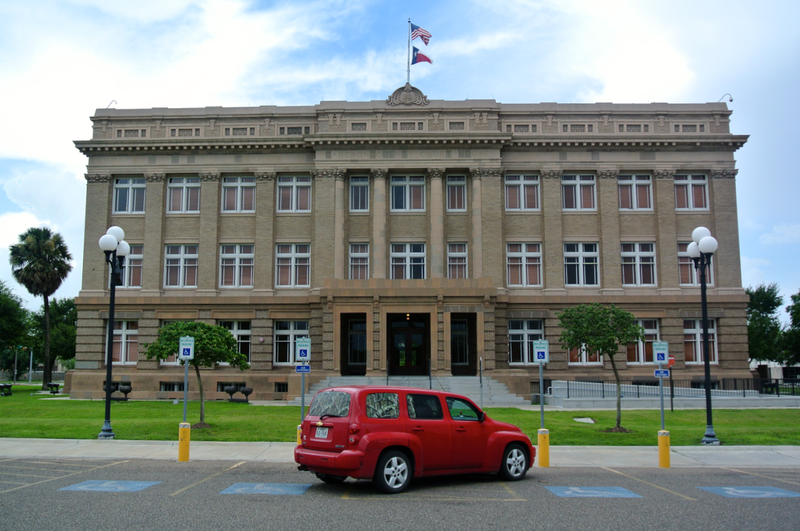 Kenedy County is the third-least populated county in Texas and fourth-least populated in the country. Stopping in Sarita, I remembered how desolate the area is. 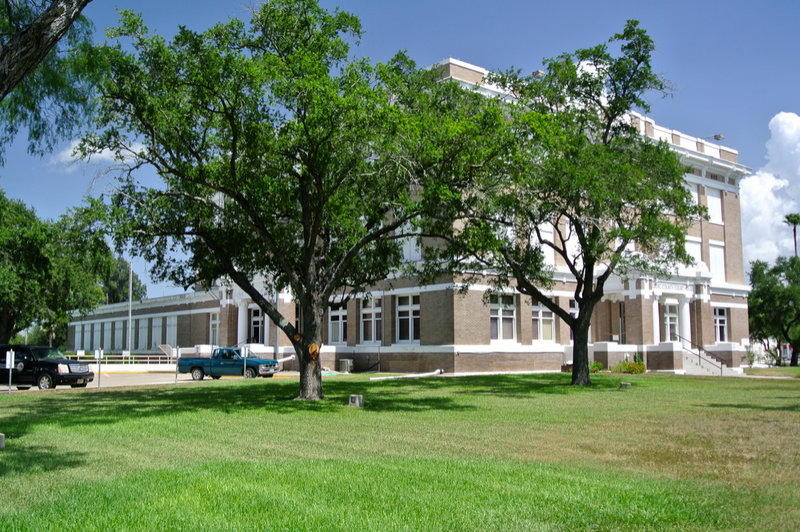 The courthouse has been restored, as has the one in Cameron County, two counties to the south. Nestled between Kenedy and Cameron Counties is Willacy County. Somehow the THC’s Courthouse Restoration Program has found its way to Sarita and Brownsville, but overlooked the courthouse in Raymondville. Hopefully, in the future they resolve the issues there. The restoration here makes the small courthouse shine. 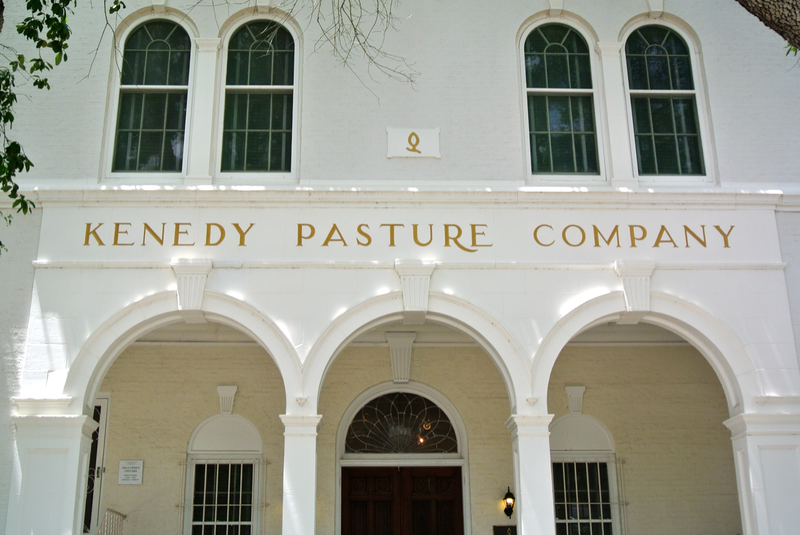 In addition to having the third-smallest population in Texas, Kenedy County’s other claim to fame is the Kenedy Ranch, a contender with the famous King Ranch for largest in the area. The headquarters are located in Sarita. Kingsville, the seat of Kleberg County (one county to the north) was undoubtedly named after the King Ranch. It was our next destination. There, I remembered a courthouse that was falling apart, quite literally. I was not wrong. 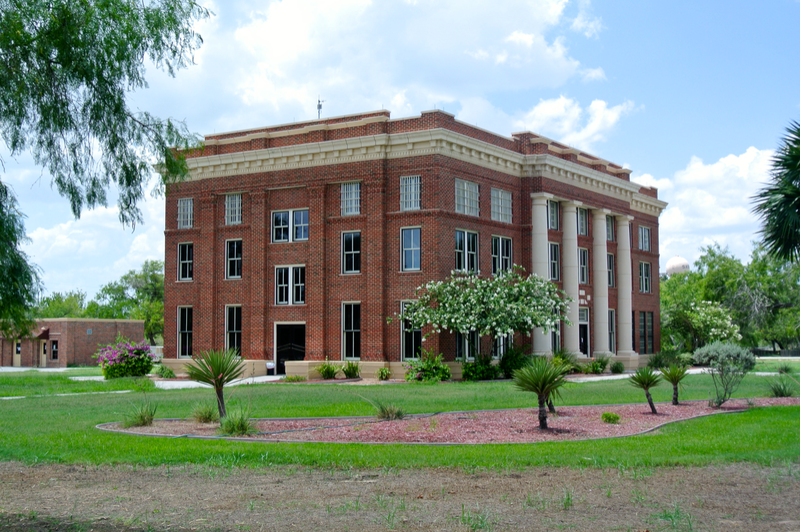 The Kleberg County courthouse is one of my least favorites. Hopefully, that will change whenever the THC gets around to visiting Kingsville. Until then, this sad building remains towards the bottom of my list. After completing my picture-taking in Kingsville and climbing back into the RV, we all applauded, as this was my final courthouse stop. The temperature was somewhere in the nineties and I was dead tired of walking around these buildings, photographing every angle I could think of. Courthousing is work, believe it or not. I was kind of relieved to be finished for the day. At that point, I still thought the day was over with. 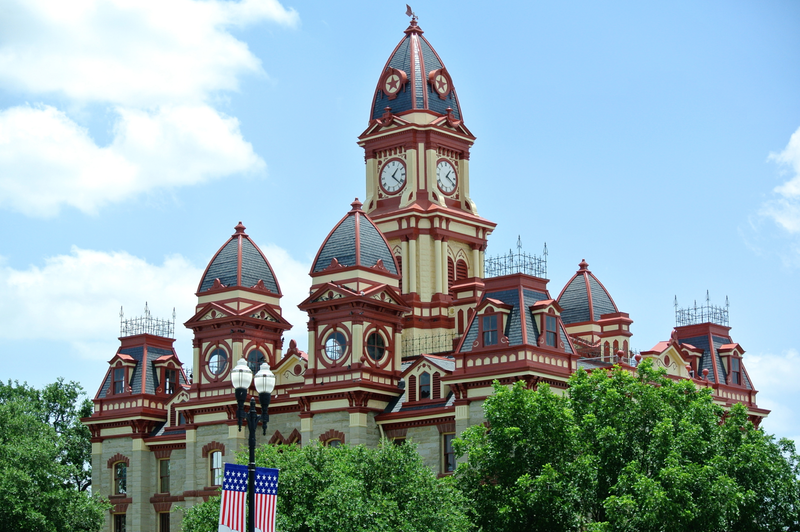 On the original trip in this region, I visited every courthouse mentioned in this post thus far (minus Caldwell County) plus those in Jim Wells, Live Oak, and Atascosa Counties. I had already planned on how to revisit these when the time came by integrating them into other trips. I figured I would get Jim Wells and Atascosa Counties when ever I took the trip to finish up South Texas and Live Oak County whenever I traveled to the Victoria-Corpus Christi region. However, because traffic on I-37 was reported to be horrific at that time of day, we decided to head north on Highway 281, to the west of Kingsville. That meant we’d be passing right through Alice and George West, the seats of Jim Wells and Live Oak Counties respectively. I didn’t think we’d stop, but my dad decided that it would not be too far out of the way to let me revisit these two as well. That’s exactly what we did. Granted the temperature was still very hot, and I was not all too happy to be walking around in the blistering South Texas heat. But, I was very glad to get these too redos done with. This should serve its purpose of freeing up time on future trips. The courthouse in Alice was first. Like its neighbor in Kleberg County, it too is in a state of disrepair. The THC needs to get down here…pronto! It’s depressing to see buildings like this in the states they’re in. 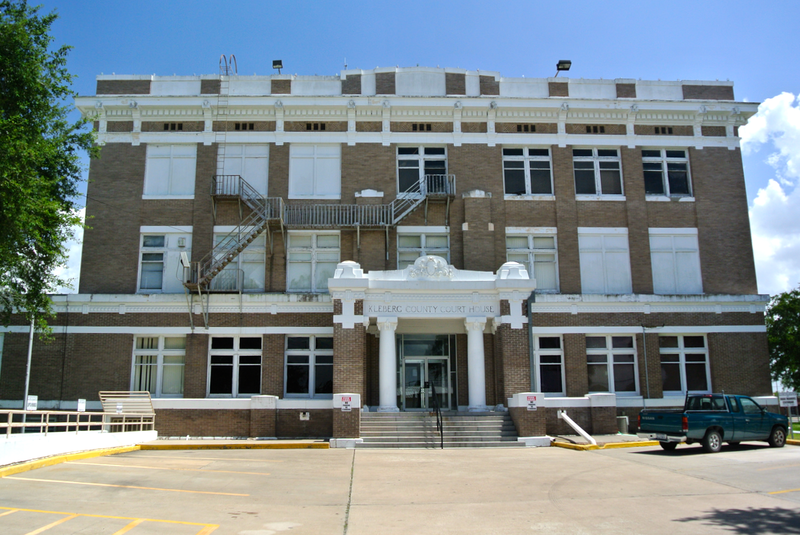 Once we left downtown Alice, we took a right on 281, leading us north to Live Oak County. The seat of George West (named for a prominent area rancher) is the “Storytelling Capital of Texas”. I remembered the courthouse here well. Besides Kenedy County, out of every courthouse I’d see today, this one was in the best shape. And even the shape it was in, was not extraordinary. On the courthouse lawn, I discovered something I missed the first time around. Frankly, I’m not sure how I did that. Geronimo is not the typical downtown feature to pass one’s eyes over. Geronimo sits in his own private “display case” (a small building on the courthouse lawn’s corner). 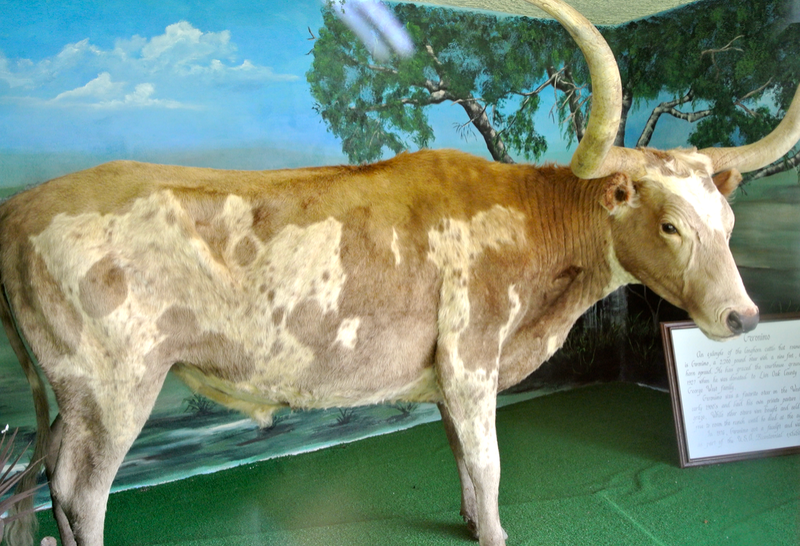 He was a favorite steer on town namesake, George West’s ranch in the early 1900s, such a favorite that when he died in 1927, he was mounted and donated to the county by the West family. And here he has stood since then. 1927 to 2014 marks eighty-seven years. That’s one old steer! Funny enough, Geronimo faces the George West Steakhouse, a restaurant across the street from the courthouse. I got a kick out of that. After George West, we navigated north to San Antonio, where we spent the night again before heading back to Granbury. As for Atascosa County, I intend to save this redo for my next South Texas trip. The next morning, we woke up early enough and then headed out, passing through towns like Blanco, Johnson City, Burnet, and Lampasas on the way home (all places I intend to revisit later this summer). Before too long, we were in Granbury after our long drive, glad to be home.